In a bleak corner of Italy—among weather-beaten concrete buildings, crumbling homes and dusty roads— lives a meek dog groomer who deeply cares for his town’s four-legged population. The people here are less kind to him, but he has his circle of friends, the men he plays soccer with, the daughter he takes out to scuba dive and his stand-offish ex-wife who greets him with casual contempt. Not all is well with the “dog man,” as the name of his store refers to him. As a side hustle, Marcello (Marcello Fonte) sells cocaine, which brings one incredibly difficult customer, Simoncino (Edoardo Pesce), with alarming regularity. Simoncino has earned most of the town’s hatred by roughing up the other shop owners. His relationship with Marcello’s no different, but Marcello is intrigued by the power this hulking man in a tracksuit wields over everyone else. He’ll try to get on this bully’s good side, even if it means losing everything else. Like Matteo Garrone’s earlier film, “Gomorrah,” “Dogman” taps into a powerless character’s lust for power. Simoncino essentially represents what the mafia could offer, like protection and influence. The movie doubles as a sympathetic allegory by writers Garrone, Ugo Chiti, Maurizio Braucci, Massimo Gaudioso. In one scene, Simoncino introduces Marcello to an upscale dance club, complete with scantily clad women who dance with Marcello at Simoncino’s nod. It’s the kind of power the dog man will never earn on his own. While his friends talk about potentially hiring an assassin to take out the town’s resident bully, Marcello tries to make his friendship work with the coke-addled violent man. The cinematography by Nicolai Brüel reflects the movie’s bitter tone. The unkempt urban landscape looks filmed through a sickly yellow filter at daytime and under the dirtiest shade of green-blue at nighttime. The saturated colors over each scene enhances the otherworldly qualities of the movie. It’s an allegorical nowhere, standing in for just about anywhere where power struggles and revenge can run free. The grimy aesthetics also enhance the work of production designer Dimitri Capuani, who makes Marcello’s world one where no one is quite clean or blameless. Every inch of the set looks like it hasn’t seen a proper scrub down in years, and the characters seem to have no access to a laundry machine. It’s a grim picture from every angle. Fonte’s performance gives Marcello’s story a layered sense of empathy. We get a sense of why he’s doing what he’s doing, without the character ever stating it. There’s even a little fear for this character before he makes his worst mistakes. We’re meant to feel bad for him when his need to please Simoncino gets him into all kinds of trouble. This works because of Fonte’s acting, which gets at the soul at the heart of a very troubled man. He understands Marcello’s kindness, someone who will go back to the scene of a crime to help save a dog’s life. Even his outbursts feel justified, although they then lead him to become an even darker character. Fonte perfectly captures the inner pain of craving respect and belonging that leads Marcello to a terrible destiny. “Dogman” is a morality tale that will make some viewers squirm away from violence and make just about everyone cringe at Marcello’s descent into depravity. The end so heartbreakingly captures what he truly wanted all along—and how he will likely never get it again. 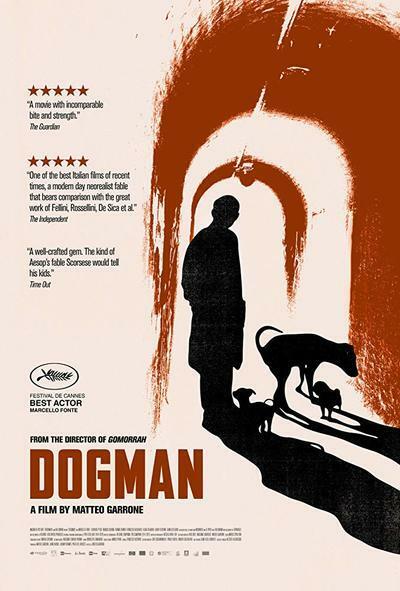 Despite its hard message, "Dogman" comes across as sympathetic for any gentle soul trying to make a deal with the devil. May you heed this movie’s warning and not end up like poor Marcello.